To be a member of Windwhistle Company of Archers you must also hold current membership of the National Field Archery Society (NFAS). This provides insurance while shooting at our sites. If you’re not already an NFAS member, we’ll usually offer tuition to help you become one before you can fully join our club. 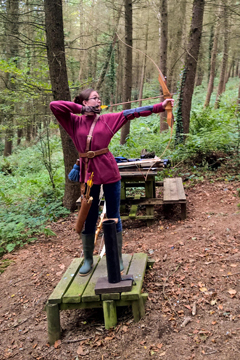 If you’re an NFAS member and you’d like to join Windwhistle Company of Archers, email us with your details, including your NFAS number. If you’re not yet an NFAS member, please take a look at our assessment/tuition section. Note that for insurance reasons, all visitors to our venues must also be members of the NFAS. Please email us if you’d like to come along to our club as a visitor, or if you’re a Windwhistle member wishing to bring a guest with you. Our club membership currently costs £27 per individual for the year. In addition, you must ensure that you maintain full NFAS membership. This is currently £20 per year, paid direct to the NFAS. Unless you’re an existing NFAS member, you’ll need to be approved by an NFAS coach first (but we can help with this). Our instructors kindly offer their time and expertise on a voluntary basis; sometimes there may be a waiting list. For further information, please email us. If you’re not yet an NFAS member, we’ll assess how much training you’re likely to need before joining. As a rough guide, the current fee for around 5 hours of tuition (usually spread out over a few weeks) is £40 per individual. During the training period, equipment and insurance are provided by the club as part of the fee. 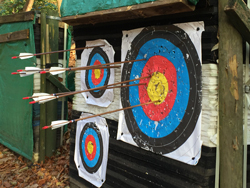 If you’d like to try archery but don’t want to commit to training for membership at this stage, why not get in touch to see whether we can accommodate your needs? Alternatively, look out for our “have a go” stall at local fetes during the summer. Members of Windwhistle Company of Archers are bound by the rules of the NFAS. However, our club has some of its own rules that apply when shooting at Windwhistle venues. For example, because we’re a traditional archery club, all arrows shot at Windwhistle must be wooden with feather fletchings. We also permit fewer types of bow/less equipment than the NFAS does.